Click here to read about day 1 of this adventure. The morning in Battle Mountain dawned clear and calm, and we were excited to embark on our flight to the Idaho Backcountry. The weather was quite variable and the forecast had been changing all week, but our last-minute briefing in the morning confirmed that our destination, Moose Creek, Idaho, [featured in our Summer 1999 issue] was forecast to have passable weather for the long weekend. We conferred with Ramona Cox, aka "Sky Chick" (see www.skychickadventures.com), who planned to meet us in the backcountry and camp with us for a few days, and we agreed to meet at Moose Creek. During the preflight, we noticed excessive oil on the right cowl flap and passenger step that had not been visible in the dark the previous night. Fortunately, Rick Harless, the owner of Harless Aircraft Services, is an A&P. He removed the cowling and spent a nearly an hour inspecting the engine for us. The final verdict was that it was likely a valve cover gasket. It would be messy, but in no way affect the airworthiness of the airplane. The final cost? No charge. Rick was just happy that we could be on our way and that we would be safe in the backcountry. With the great service, the courtesy car, and reasonable fuel prices, Battle Mountain is one of those small-town FBOs that is really a pleasure to visit. The first leg of our flight took us across the mountains of northern Nevada. The valleys had sagebrush interspersed by dry lake beds, while the mountains still retained patches of snow and a few trees. A check of the weather using the XM Satellite Weather on our Garmin GPS revealed that the weather was deteriorating in central Idaho. It was still flyable, but scattered showers were moving through the area and forecast to continue affecting the weather for the next few days. 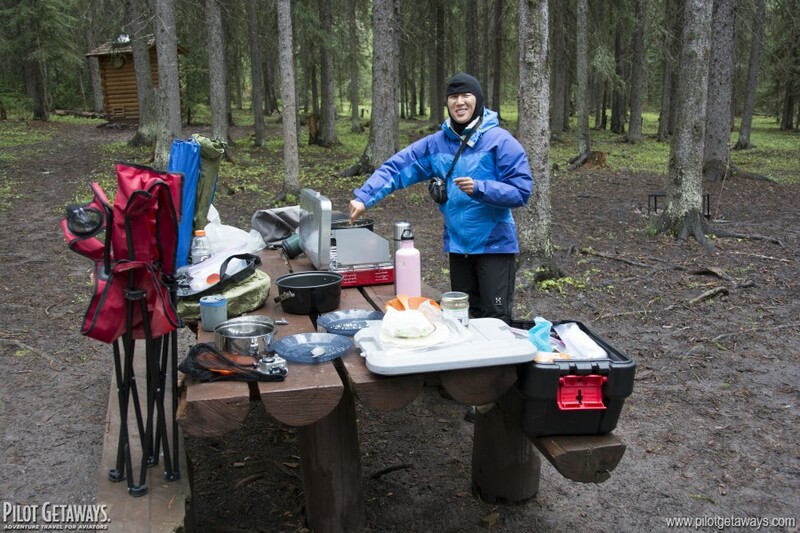 The prospect of a soggy camping trip didn't appeal to us. Fortunately, Sky Chick was still in the air and listening to our air-to-air frequency. 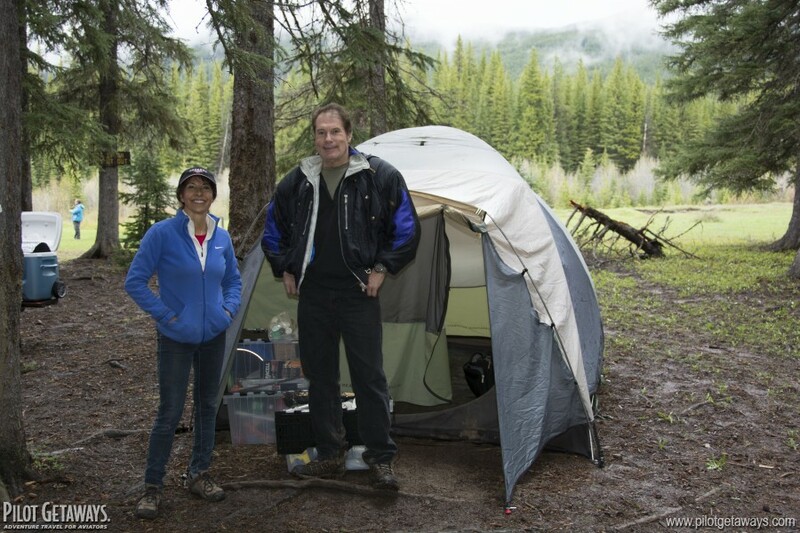 We discussed options and changed our destination to Schafer Meadow, Montana, [featured in the Summer 2000 and Sep/Oct 2007 issues] where the weather appeared to be improving. Although it was an hour farther away, Schafer Meadow is my favorite backcountry airport. 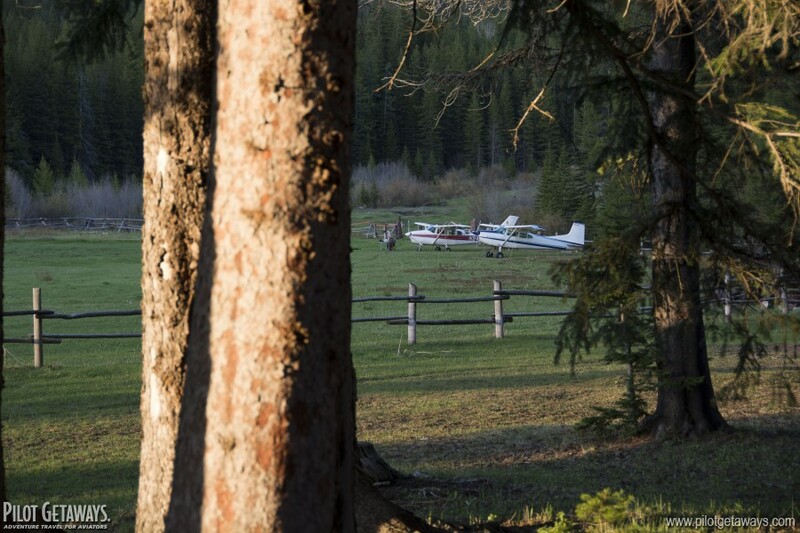 Deep in the Bob Marshall Wilderness, the airstrip is only accessible by airplane or on foot. It is situated on a lush meadow on the banks of the Middle Fork of the Flathead River, a 15-mile hike from the nearest trailhead. This wilderness is so remote, that it contains the highest concentration of grizzly bears in the lower 48 states. 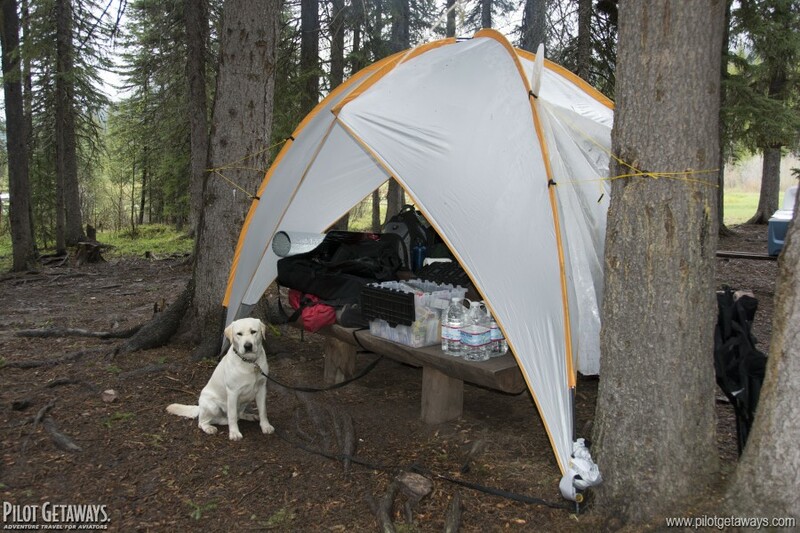 Our new route took us up the Middle Fork of the Salmon River, to the west of the jagged peaks of Idaho's Sawtooth Mountains, and then down the Bitterroot River, past Missoula and Seeley Lake, into the Bob Marshall Wilderness. We discussed landing at Sulphur Creek Ranch, a fly-in ranch deep in the Frank Church River of No Return Wilderness that we featured in the Spring 2003 issue, for brunch, but decided against it due to the ever-changing weather situation and the possibility that we would get stuck there if the weather deteriorated. This log cabin near the headwaters of the Middle Fork of the Salmon River is only accessible by airplane. A few cabins are available for overnight use, and hearty meals are served in the two-story main lodge. In the 1930s, the area was even more remote—and lawless—than it is now. The proprietors used to fly miners in on a Ford Trimotor aircraft and operate the lodge as a brothel. Today, you can still see the small rooms on the second floor used for that purpose. Caroline had never seen the Idaho and Montana backcountry before, so we detoured a little en route to see the sights. Among them was the Chinese Wall, a 1,000-foot high escarpment that runs for nearly 20 miles along the Continental Divide. This sight is in such a remote section of wilderness, the only way to get there is on a multi-day pack trip on horseback or backpacking trip, yet we were able to make a ten-minute detour and fly along the rugged rock cliffs. Our timing was perfect, and Sky Chick arrived over the airport about one minute before we did. She let me land first, since I had been there before and could report on the surface conditions. There was about a 10-knot crosswind, which caused a bit of turbulence through the flare due to the surrounding trees, but the surface was firm and smooth. 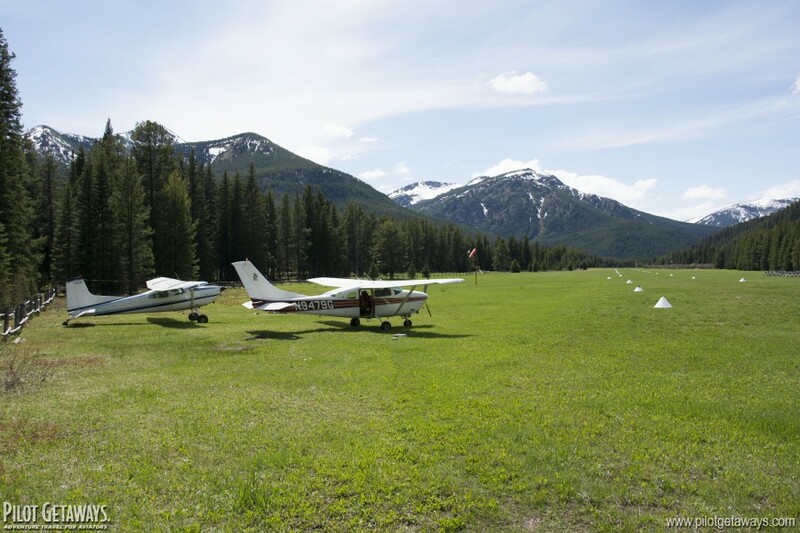 Landing on the 3,200-foot grass strip at Schafer Meadow USFS Airport in Montana. Most landings are made to the west on Runway 25, despite the slight downhill slope of the runway, due to the better options for a go-around. The airstrip is at 4,855 feet elevation in the remote Bob Marshall Wilderness complex adjacent to Glacier National Park. After landing, we discovered that the 300 lbs. of gear we had brought was nothing compared to Sky Chick's load. Her airplane has a 3,600-lb. gross weight (compared to my gross weight of 3,350 lbs. ); it appeared that she and her traveling companion, Dave, had used most of that capacity. They had more than 500 lbs. of gear including a heater, generator, and full HD video equipment. Ramona admonished us to not make too much fun of her, lest she withhold use of the luxuries she brought in. Her gear certainly came in handy later that evening when the temperature plummeted to 28 degrees F. We congregated in my tent, and Ramona brought a special propane heater that is safe to use in enclosed spaces like camping tents, which rapidly raised the temperature to a comfortable level. She earned our gratitude and respect as being the camper extraordinaire on this trip. Schafer Meadow has one of the nicest airport campgrounds I have ever seen. It is right next to the grassy tiedown area at the east end of the airport. 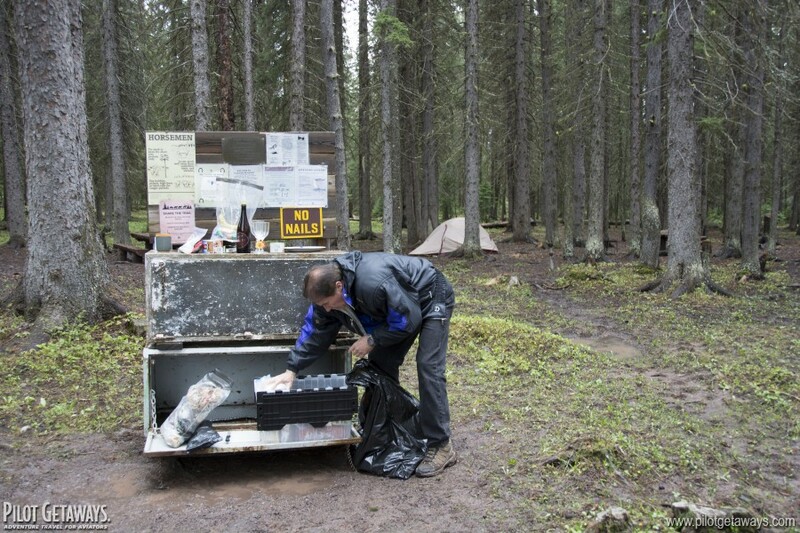 A small brook runs by the campsites, and a spigot provides filtered water without the hassle of pumping. A super clean outhouse (with handicap access! ), fire pits with barbecue grills, wooden picnic tables, and metal bear boxes round out the amenities. We had to remember to store everything with any scent on it in the bear boxes, lest we awake to an unwelcome intruder in the night. 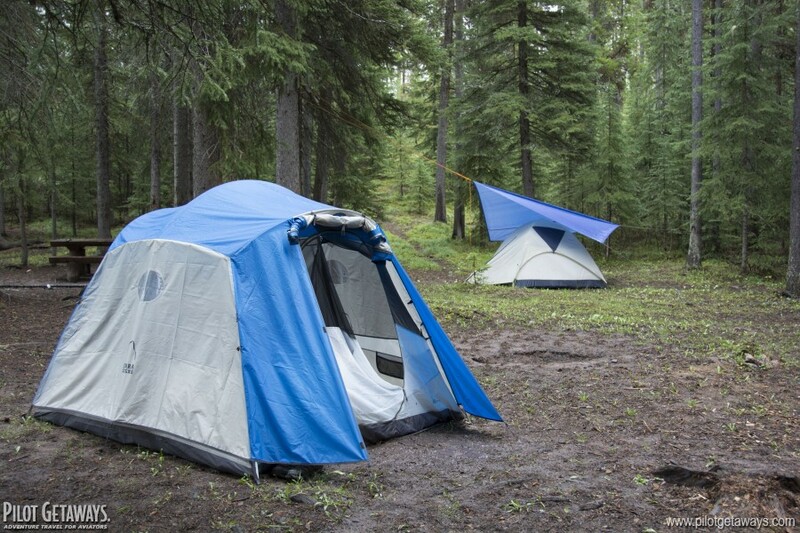 The only other people in our campsite were a pair of bow hunters who were looking for bears. They said they saw fresh grizzly bear tracks through the campground when they arrived the previous day. Lugging 800 lbs of camping gear to the campground, setting up camp, and filling our water containers took most of the rest of the day, so we only had time for a short walk to the riverbank, where Radar swam in the frigid waters. On the way back, we stopped at the backcountry ranger station and met with the USFS volunteers. They cook with a wood stove, and they can sometimes take a hot shower if they heat a water reservoir with a wood fire. Since there is no electricity, the buildings are connected with each other with an antique crank telephone, like you see in old movies. Click here to read about day 3 of this adventure.